Continuing with our tradition of explaining shinto stuff that nobody is really interested in, today Dr Trouble tackles Sarutahiko (猿田彦) - a local deity, who guided Amaterasu's grandson to victory. 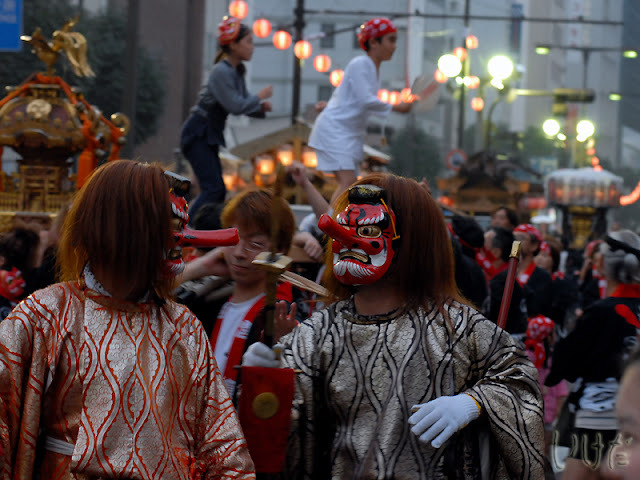 Some of you may wonder who the heck that long-nosed, reddish-faced guy at mikoshi parades is. At mikoshi parades, you can normally find him in the very front row of the procession (not always, but most likely). Long-nosed red-faced god chatting with a tourist along the mikoshi parade route at Futaara shrine in Nikko. Believe it or not, he is a god, a very unusual god, who appears in the collection of Japanese myths - Kojiki (古事記) and Nihon shoki (日本書紀). His name is Sarutahiko (猿田彦). 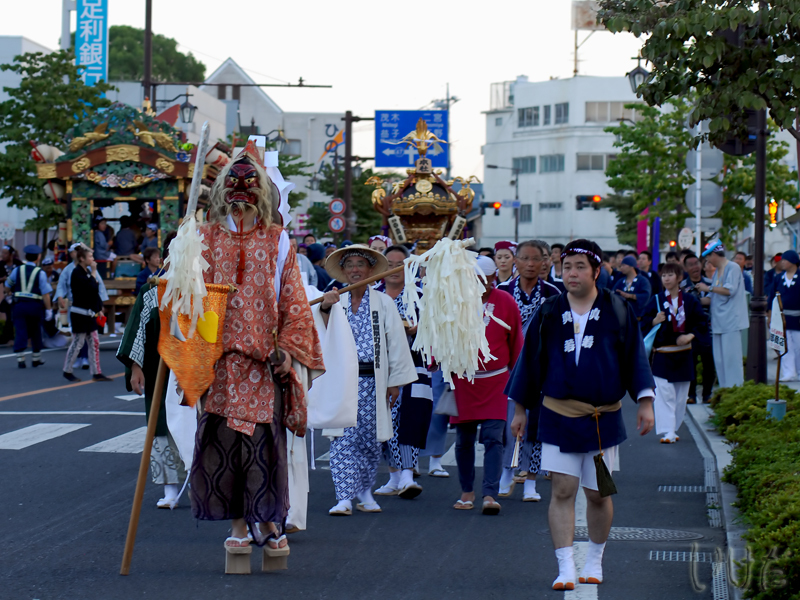 In this blog entry I will try to explain why this god has such an outrageous outfit, walks at the front of the mikoshi procession and guides the entire parade. 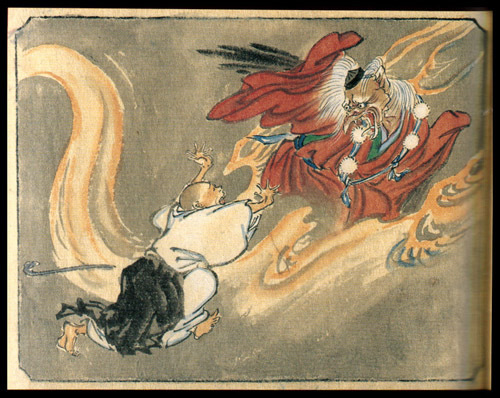 In Kojiki (古事記), Sarutahiko (猿田彦) appears in the chapter titled “Tenson Kourin” - (天孫降臨), meaning grandchild (孫) of Amaterasu (天照大神); descending (降臨) from Taka Amahara and ruling Ashihara Nakatsukuni (葦原中国). The grandson’s name is Ninigi (no Mikoto) (邇邇芸命) and his father (son of Amaterasu, in other words), Ameno oshihomimi (正勝吾勝勝速日天忍穂耳命) suggests for him to go down from Taka Amahara (高天原 - this word has a variety of pronunciations in Japanese) to Ashihara Nakatsukuni (葦原中国 - where non-gods live) to rule (or conquer) the place. Anyway, the chapter of Tenson Kourin (天孫降臨) depicts the story of ancient gods (grandson Ninigi and other gods from the Amaterasu side) showing their military presence to the local powers governing the western part of Japan. And after defeating those local powers, the military influence of Amaterasu stretched all the way down to the southern tip of Kyushu - to Minami Satsuma (南さつま), a city in Kagoshima prefecture. 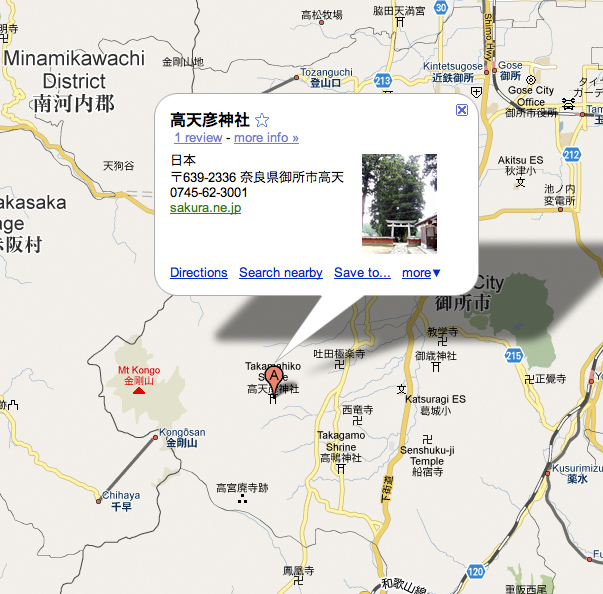 Where is Taka Amahara (高天原) - where does Amatsukami live? Taka Amahara (高天原) is considered to be the area where, a long, long time ago, the ancestors of the current Imperial family had ruled. 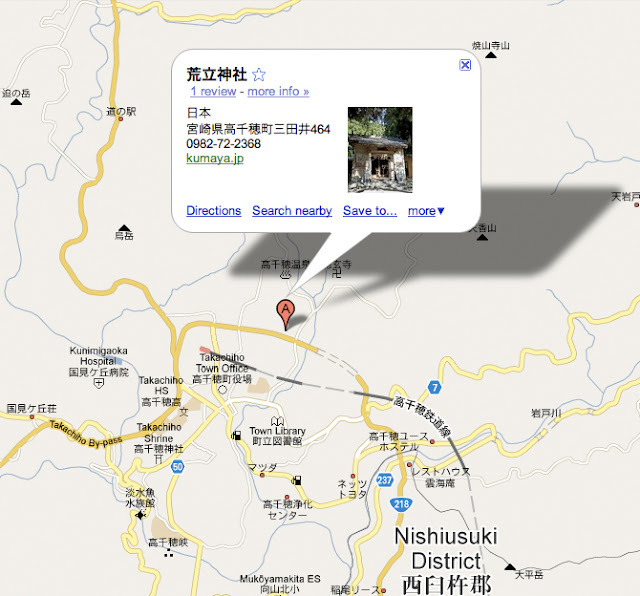 Japanese myth scholars still argue about the exact location of Taka Amahara (高天原). Some non-scholars (myth otaku) say that Taka Amahara (高天原) could be overseas (Korea, southern parts of ancient China, Iraq or even Israel)!!! Year, laugh if you want. No historical evidence has been found to support the Mideast or Israel theory of Taka Amahara. Until the mid-Tokugawa shogunate era, Kyoto court believed Katsuragi (葛城) in Yamato district (大和) to be the place. Yamato Katsuragi is an ancient description of Gose city (御所市) in Nara prefecture (奈良県). In Gose city, Takamahiko Shrine (高天彦神社), one of the most prestigious shrines described in Engishiki (延喜式), is located at the east side of Mt. Kongo (金剛山). The ancient name of Mt. Kongo is Taka Amahara yama (Mt. Taka Amahara; 高天原山). Where is Ashihara Nakatsukuni (葦原中国)? This is also controversial. Some say it’s in Kibi no Kuni (吉備国), the area which corresponds to the whole of Okayama prefecture, eastern part of Hiroshima prefecture, part of Kagawa prefecture, and western part of Hyogo prefecture. 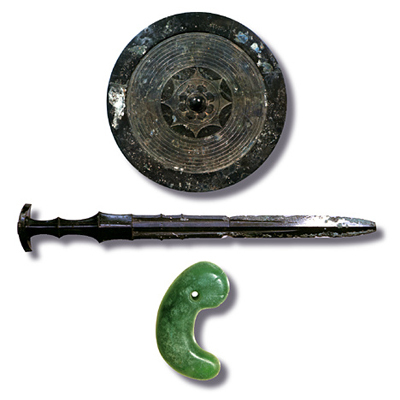 Others say that it signifies Izumo province (出雲国) and its surrounding areas (current Chu-goku area 中国地方), or Kyushu area (九州地方). While Ninigi (邇邇芸命) and his five companions: Ame no koyane (天児屋命), Futodama (布刀玉命), Ame no Uzume (天宇受賣命), Ishikoridome (伊斯許理度売命), and Tama no oya (玉祖命) went trooping around, they brought Sanshu no Jingi - Imperial Regalia of Japan (三種の神器) with them: Amanomurakumo no tsurugi (a sword - 天叢雲剣), Yata no kagami (a mirror - 八咫鏡), and Yasakani no magatama (a jewel - 八尺瓊勾玉). Imperial regalia photo from here. They are not the original (real) ones, however. There are several hypotheses as to where they are now located. One hypothesis is that the current emperor has them all because having them all IS the absolute proof to be the successor of the first Emperor Jimmu. Besides those five followers listed above, Ninigi was accompanied by three more gods, Omoikane (常世思金神), who takes care of ritual ceremonies, Ame no tajikarao (天手力男神), and Ame no iwatowake no kami (天石門別神). When Ninigi’s group was about to cross into hostile territory, at the border they met Sarutahiko (猿田彦). Sarutahiko (猿田彦) is a Kunitsu kami (国津神), a rural god in Ashihara Nakatsukuni (葦原中国), who is “illuminating” from Taka Amahara (高天原) to Ashihara Nakatsukuni (葦原中国). The second kanji of Amaterasu (天”照”) - "terasu" (照), means “to illuminate”. Based on this description, the English language wiki interprets him as being a leader of earthly (国) kami (神) - Kunitsu kami (国津神). 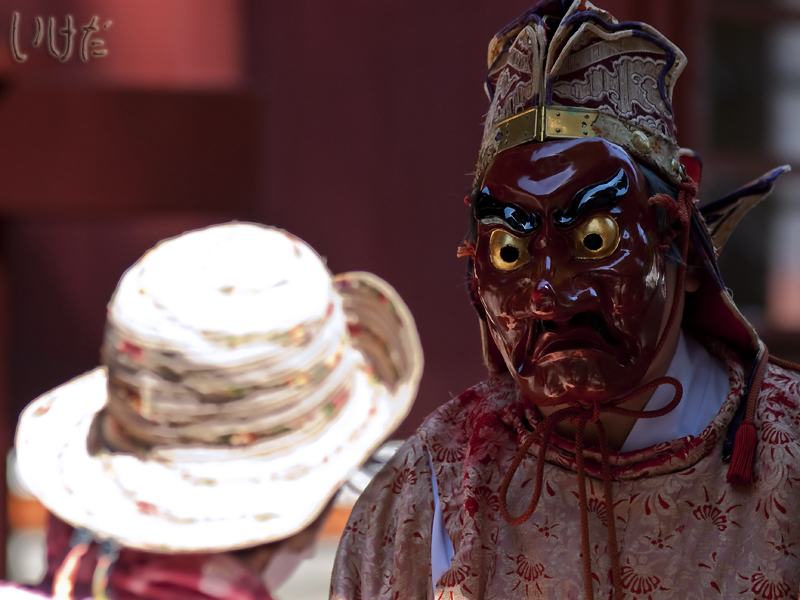 Sarutahiko (猿田彦) is one of the very few deities whose appearance is described in great detail. He is 7 shaku (尺= an ancient unit that is almost the same as one foot) tall, which would be about 210 cm; and his nose reaches 7 ata (=咫; an ancient unit of a circle’s circumference. 1 foot diameter of a circle’s circumference corresponds to 4 ata). That means the diameter of his nose is 1.75 feet! That’s bigger than a normal person’s entire face, isn’t it? After Amenouzume went over to check his ID, Sarutahiko introduced himself and was kind enough to offer to be their guide in the hostile territory. His offer was accepted and thanks to Sarutahiko, Ninigi’s military mission was successful. After Sarutahiko’s mission was completed, Amenouzume (天宇受売命) sent him back to his hometown, nearby Isuzu river (五十鈴川) in Ise (伊勢); currently Ise city in Mie prefecture (三重県伊勢市). Later on Sarutahiko and Amenouzume got married (see ladies, this is what happens if you start asking strange guys questions, you may end up marrying them, just ask Ms. Trouble, she can confirm) and from that time on Amenouzume is called Sarumeno Kimi (猿女君). This husband and wife team tends to be enshrined as a pair in many shrines. Aratate shrine (荒立神社), link in Japanese only, is believed to be the place of their marriage and where their house was built. Aratate shrine is in the middle of nowhere! 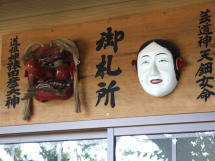 Image from Aratate shrine website, showing face masks of Sarutahiko (猿田彦) and Amenouzume (天宇受売命/天鈿女命) (from left to right). Two shrines, Tsubaki ookamiyashiro (椿大神社) - Tsubaki grand shrine in Suzuka city and Sarutahiko shrine (猿田彦神社) in Ise city (both in Mie prefecture) are well-known for enshrining Sarutahiko. 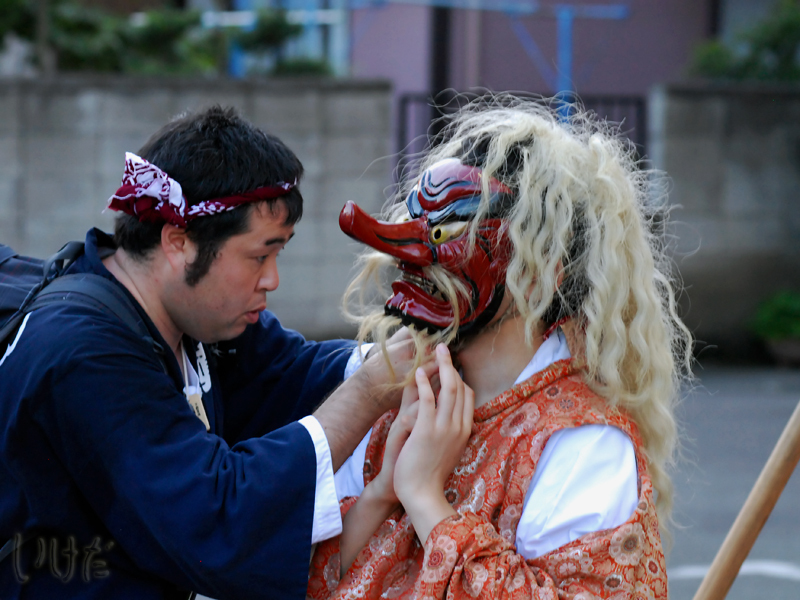 Due to his terrifying appearance, Sarutahiko is considered as the origin of Tengu (天狗). Although the name of Tengu was taken from a dog-looking Chinese demon, it morphed into a crow in artistic depictions in Japan. Back in the olden days Tengu’s appearance wasn’t really specified and there were many different descriptions of him. However, later on, the image converged into a reddish faced bird looking supernatural creature with an unnecessarily long nose wearing a training Buddhist monk’s (Shugensou - 修験僧, or Yamabushi - 山伏) outfits and tall wooden sandals - geta (下駄). 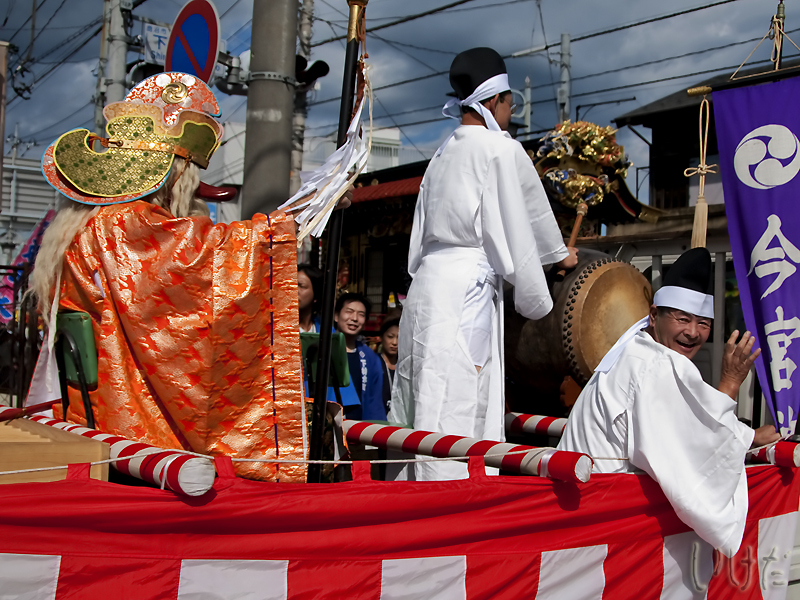 Since Sarutahiko’s role was as a guiding god, he appears at the front of mikoshi (a portable shrine with a god inside) during mikoshi processions. "explaining shinto stuff that nobody is really interested in"... well, that's not true... I'm interested... (^_^) Excellent article!